Here we discuss the current applications and potential benefits of PROMs in healthcare and challenges that reduce their potential to drive improvements in patient care. 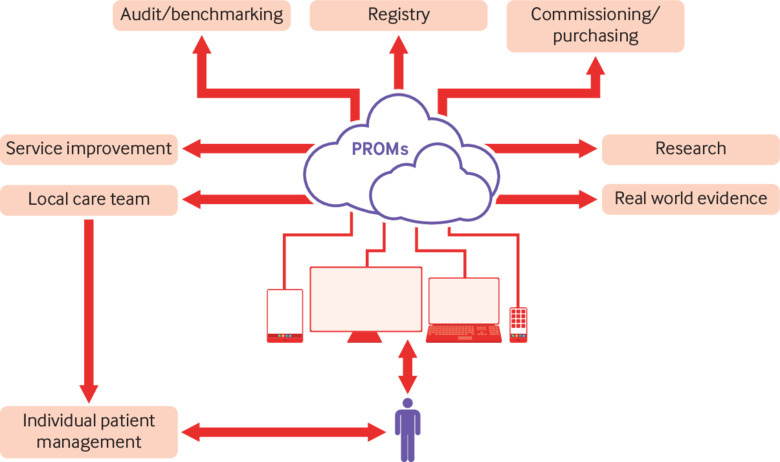 We focus on recent developments in the use of PROMs and consider strategies for efficient PROM data collection to maximise benefits for patients and society. PROM assessment in research and routine clinical practice offers a range of potential benefits for individual patient care and for clinicians, regulators, healthcare management teams, commissioners, and policy makers (table 1). By contrast, using PROMs at the individual patient level is relatively new. PROMs can be used to inform clinical decision aids, for shared decision making, and to tailor care to individual patient needs. Electronic capture of PROMs in clinic and between appointments allows real time monitoring of symptoms, flexible scheduling of hospital appointments in response to PROM data, early detection of problems, and prompt clinical intervention.33 A US randomised trial of web based symptom monitoring in patients receiving chemotherapy showed that use of the tool was associated with better quality of life, fewer emergency hospital admissions, and increased survival.89 In Denmark, the AmbuFlex telehealth system is being used to schedule outpatient appointments for chronic conditions, including asthma, chronic obstructive pulmonary disease, epilepsy, sleep apnoea, and cancer.1213 PROMs are completed by patients at home and used for decision support to evaluate the need for a consultation, reducing the need for unnecessary outpatient appointments. To date, 31 000 outpatients have been referred to AmbuFlex follow-up, and 115 000 telePRO based contacts have been completed. Several challenges have hindered both uptake and benefit to patients of PROMs (box 1), with major problems found in PROM study design, implementation, reporting, and interpretation.26 PROM data collection is fragmented, with limited coordination—if any—between teams responsible for research and routine care. Clinical disciplines often lack a standardised approach to assessment. Patients may be asked to complete multiple questionnaires, often with overlapping items, which can be burdensome and confusing. Furthermore, PROMs are often poorly or not reported, which limits their effects on patient care and is unethical.2938 Evidence shows that clinicians find that collecting PROMs improves clinical care and workflow and is “beneficial rather than burdensome.”4 But some clinicians think that these data are “subjective” and therefore biased or unimportant compared with laboratory findings. We need a strategic, coordinated, integrated approach to PROM assessment, a view supported by international qualitative research.39 This approach should be aimed at creating a non-burdensome pathway for patients to provide meaningful PROM data that may be used to support shared decision making, as well as provide a patient centred data pipeline for audit, benchmarking, research, and real world evidence (fig 1). Routine remote PROM monitoring could be used to support not only patients at high risk of emergency admission but also the millions of people who have multiple long term health conditions to reduce unnecessary outpatient appointments, promote medicine adherence, and tailor care to individual needs. Beyond optimising healthcare resources, this approach offers broader benefits to patients and society, with potential reductions in time off work, carer burden, and carbon footprint. Integrative approaches to PROM assessment should consider ways to reduce inefficiencies in data acquisition: a harmonised approach to the selection, collection, analysis, and reporting of PROMs, integration into the electronic health record, and guidance on the optimal presentation and use of data (fig 2). PROMs should measure outcomes that correspond to stakeholder needs. Identifying these outcomes and what matters to patients should be a priority. Regulatory agencies may focus on physical symptoms and functioning to inform licensing and labelling claims, whereas patients and health policy makers may be more interested in other domains of health related quality of life, such as participation in social activities and emotional wellbeing.41 Stakeholder relevant PROMs can be identified through patient involvement, qualitative research, or core outcome sets. These provide a set of standardised outcomes to be assessed in routine practice or effectiveness trials. They often include traditional clinical outcomes, such as all cause mortality, alongside measures of symptom burden, functioning, and disease control, which can be measured using PROMs. Several core outcome sets are available from the International Consortium for Health Outcomes Measurement42 and the Core Outcome Measures in Effectiveness Trials initiative43; further efficiencies may be gained, however, if a single core outcome set can be generated for research and routine practice for a clinical area or a broader set of conditions, such as inflammatory diseases. Identifying and selecting valid, reliable tools that are acceptable to patients from the target population may be challenging. The Consensus Based Standards for the Selection of Health Measurement Instruments initiative and the Evaluating the Measurement of Patient Reported Outcomes programme provide useful guidance to support the review of measurement properties.4445 Selected PROMs should have been developed with patient input,27 but this is not the case for many commonly used measures. A further challenge is the use of different measurement scales, which make it difficult to compare across measures. The Patient Reported Outcomes Measurement Information System (PROMIS) aims to provide measures scored on a common scale across global, physical, mental, and social health domains. The PROMIS items can be used for computerised adaptive testing to reduce patient burden.46 Further benefits of PROMs may be realised through individualised measures, but research in this area is scarce.32 Ultimately, the utility of the measure may differ depending on context and purpose, but wherever possible systems should be designed with multiple use in mind. Patients need to know who will access their data and how their data will be used. Clearly this has important consent implications for integrative PROM collection, which must meet data protection regulations. PROM data may reveal worrying levels of psychological distress or physical symptoms that may require an immediate response, known as a “PRO alert.”34 Clear response pathways for the management of PRO alerts should be in place, and issues around legal liability for failure to act must be considered. Overarching guidance on governance would help implementation of PROMs and promote efficiency in delivery. Data will need to be analysed and reported using different templates tailored to stakeholder needs. PROM data are currently presented in a wide range of formats and further research is needed to optimise their presentation for accurate interpretation of the data and to make it useful.47 We have found that training and support is needed during early adoption. Routine collection, processing, and sharing of PROMs may offer huge benefits to society through better health outcomes and use of resources. There is clearly much to do to maximise the benefits of PROMs for patients and society. A crucial first step is to establish a national multi-stakeholder steering group, involving patients, clinicians, PROM methodologists, regulators, policy makers, and NHS digital to standardise PROM data and to establish and share knowledge and good practice. Integrated approaches to data collection will help promote optimal efficient collection, reduce patient burden, and enable us to harness patient centred data alongside health and biomedical outcomes to tackle healthcare challenges at scale. Greater collaborative multi-stakeholder efforts are required both nationally and internationally for the benefits of PROMs to be realised. Contributors and Sources: MC wrote the first draft of the article, which arose from a series of discussions about the topic with coauthors. The piece draws upon broader discussions from the Centre for Patient Reported Outcomes Research (CPROR) Institute of Advanced Studies workshop led by MC, DK, and GP in February 2018 and attended by JMV and NH and from discussions with Ethan Basch, distinguished visiting professor, in November 2017. MC is director of CPROR at the University of Birmingham and leads cross cutting PROM research at the NIHR Birmingham Biomedical Research Centre and the NIHR Surgical Reconstruction and Microbiology Research Centre at the University Hospitals Birmingham NHS Foundation Trust and the University of Birmingham and Health Data Research UK Midlands. She led development of the SPIRIT-PRO and CONSORT-PRO extensions. DK is an NIHR fellow, deputy director of CPROR and is leading development of PRO systems in routine NHS practice. GP is a patient partner and member of the CPROR executive. JMV is president of the International Society for Quality of Life Research, has recently provided advice to the Organization for the Economic Cooperation and Development on developing patient reported indicators of health system performance, and recently completed an NIHR funded programme of research on PROMS in primary care (NIHR/CS/010/024). NHH led the development and implementation of the AmbuFlex PRO system in Denmark and is leader of the WestChronic research unit at the Aarhus University Research Clinic, Herning, Denmark. MC is guarantor. Funding: This is an independent analysis funded by the NIHR Birmingham Biomedical Research Centre and the NIHR Surgical Reconstruction and Microbiology Research Centre at the University Hospitals Birmingham NHS Foundation Trust and the University of Birmingham. The views expressed are those of the authors and not necessarily those of the NHS, the NIHR, or the Department of Health. Competing interests: We have read and understood BMJ policy on conflicts of interest and declare the following: MC has received personal fees from Astellas, Takeda, and Glaukos outside the submitted work and grants from the NIHR and is a coinvestigator at Health Data Research UK Midlands. DK is supported by the NIHR postdoctoral fellowship scheme (PDF-2016-09-009). JMV has received grants and fellowships from NIHR and Instituto de Salud Carlos III (Spain), grants from MRC, CRUK, Royal Devon and Exeter Trust, Fondo de Investigaciones Sanitarias (Spain), consultancy fees from the World Health Organization, and Technische Krankenkasse (Germany) and currently is chairman (unpaid) of the International Consortium for Health Outcomes Measurement panel for the development of core sets of outcomes for Health Overall Adult Health. GP and NHH declare no competing interests.
. Power to the people—via Paris. BMJ2017. https://blogs.bmj.com/bmj/2017/01/20/tessa-richards-power-to-the-people-via-paris/.
. Getting the most out of PROMs. Putting health outcomes at the heart of NHS decision making. King’s Fund, 2010.
. National implementation of clinical PRO in Denmark. Qual Life Res2015;24:1-191. University of Birmingham. Heart Failure: Improving the quality of life and survival of heart failure patients through cardiac resynchronisation therapy. 2014. http://impact.ref.ac.uk/CaseStudies/CaseStudy.aspx?Id=38798. FDA. Guidance for industry: patient-reported outcome measures: use in medical product development to support labelling claims. https://www.fda.gov/downloads/drugs/guidances/ucm193282.pdf.